Obrafour is mournful on this Nature produced number. He has always been the one to hold his head and lament, but this song is the saddest I've ever felt him. Why is it even possible, how is it even allowed, that as a man approaches the age of legacy, he's this broken? But Obrafour, who has nothing else to prove to us musically, still harbours such intense grief. It is for his rap we revere him; always clean and decent, deep and mature, specific and practical truth --but we respect him for his singing too; brief, pleasant and easily familiar. Some of his vocal deliveries, his hooks especially, have been highly successful here; Saa Okodiɛ no, Swedru Agona, Abena, Ohene. Now these are recent but of course he's had memorable choruses since "Pae Mu Ka." "Nokwere ensaa yɛ, nipa na ɛmpɛ ne ka" , which translates as " truth still abounds, only, man refuses to speak it. " " Onyame mmra na afei y'ato akwene na/ ya dane y'eni su nyansafuɔ na yee bu nipa"
"Onyame ekyidifuɔ no po na ɛ ma ne yɛ ya/ efiri sɛ won nyinaa nyim sɛɛ daakyi wɔbebu akuntaa/ ɛnso twurɔsɛm no asɔfuɔ ashɛ no knicker"
Don't worry, I'll translate. The above lines refer to how we have discarded God's laws and have become wise in our own eyes and are swindling people, how it is the followers of God who are most surprising; that even though they are aware of a judgement, they ( "pastors") have changed the apparel of the word of God. In the same verse, he wonders why pastors are putting their abilities, oil and water up for sale, as God first gave them their gifts for free. He cites Peter in the Bible, saying that unlike contemporary pastors, he healed for free. He also mentions something poignant: the words in the Bible are definite, but interpretations differ, so depending on how good you can spin understanding, you'll be successful, which is why pastors would scold their members and call it a sermon. His singing on Nkontompo is especially emotional, he's wailing, even. In the chorus, when he says "me werɛ aho", it makes you shake your head slowly. He doesn't have a very good voice, he's never had, but what he lacks in vocal space, he makes up for with raw, honest emotion...and on so many levels, emotional honesty is more important than vocal talent; Joseph Hill, Amakye Dede, Kanye West sometimes, and Sarkodie, on Mary. Religion is service to a deity and and the obsession with odd ritual. Love is good intentions toward the one standing next to us. Menocchio says that it's more important to love one's neighbour than to love God. Deep down, we do not disagree with this, so that's it: love trumps religion. Indeed it's the theme of every religion, it's the central message of every great leader or rabi who has ever treaded here, so religion is a love too. Even without bothering to research, I am certain that religion has the most influence on us. The biggest gatherings are crusades and the Hajj. The most widely read stuff are religious literature...but you already knew that, so let's progress the argument. Let's be objective, all through history, religion too...the politics of its philosophy has, on its own, been responsible for some of the most monumental acts of hatred to the brain, heart, knees and toes. It's a shamefully wide range, from bloodshed to noise pollution. His second verse is just as spirited. There are abbrasively truthful words on shameless corruption, pointless propaganda, the various versions of the truth, religious extremism, the love for money alone, how we stifle those who speak up and how we've turned this country into hell all by ourselves. It's remarkable how he's stuffed all that in the space of one verse. Obrafour is a lyricist, and there's no debate there. Who else do you know that can sing, rap, preach, advise, talk about love and women, and still maintain a dignity and depth? Who else do you know who can do all this with proverbs and in Twi? 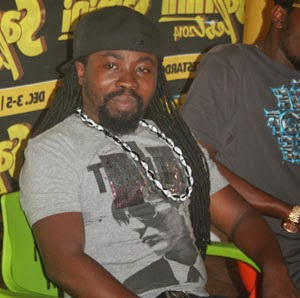 Obrafour is our ultimate social commentator. It is what we have come to know him for, and why we have grown to trust him. Periodically, he has had to remind us that it's in a chaos, and not a bliss, that we are so comfortable. It is in that way that he has constantly remained relevant to us...like our community Imam or grandmother. Our Imam is tired. Our grandmother is spent. The village old man has lost hope. For all of their adult lives, they've been saying the same thing: "wise up, my child, wise up". And if you've said the same thing over and over, and all you see is scanty change, you too would be tired.Obrafour embodies these emotions in Nkontompo. The instrumentation is rich and complex. It tells a story too...a parallel story. The electric guitar for instance, shows us a facial expression of strain, pain, and the verge of giving up. The horns suggest a danger and the piano invokes sustained sadness. Indeed, one reason the song stands out is how deep horn and organ sounds are sustained, right from the beginning. It's dark and dangerous, profoundly gothic...and we instantly know something troubling is pending. A lot of things are happening in the song, it's a picture of disaster, or the scene after a massacre which you can't look away from. It's a gorgeous and disturbing paradox: I have mentioned that the spine of the song is how some sounds are sustained, but at the same time, many of the sounds in the song are choppy and piercing. Like the message of the song, it's supposed to make you uncomfortable. It pulls at your skin and keeps you attentive. But Red Eye, or Nature (when he's producing beats and not rapping hard and demented in Ga) too, has always been eccentric and warlike...more experimental too with other rhythms than Hammer would touch. From his early work with 2 Toff, the group he belongs to, to Kwaw Kesse, to Edem, he has constantly proven to be a strong and versatile hand. For 2 Toff, he worked on " Yɛ Na Bra", on which they featured Castro. Several years on, on "Meawezo" the song on which they announced their comeback after a long exile from Ghana's music industry, he rendered a parallel sound which was both modern and at the same time, invoked the nostalgia of "Yɛ Na Bra". Nature might have done way more for Kwaw Kesse's "Poppin" than we may be praising him for (if we are praising him at all), as all Kwaw did, really, was to give a fun chorus. Both reggae songs Nature did for Edem are infectious; "Make Money" and "Ghetto Arise" are testimony to the diversity of his talent. Nature too, has been a fan of the trumpet, which, like I have said elsewhere, works excellently as warrior melody and death announcement. He's also remorseless with the guitar, and it's remarkable. Truth is truth, and common sense lays around. It doesn't have to come from the high and mighty for it to be truer. Obrafour is just a man, it's all he's been this whole time. He's faced the valleys of the shadows, he testifies in his song "My Praise", he's had public banters with fellow rappers and felt good about it, which is a bad example and might reduce drastically his moral leverage should he advise younger rappers to bury the hatchet. He's imperfect, but the "blameless" ones may have failed us. All we need to speak up to life and against it, is to be a man or woman, and that refers to you and me...Obrafour too. "M'asɛm tia yi eko ma yɛn nyinaa"
He's a tired old man, but he's a special kind of tired and old. He's our favourite old man...tired or not. It's not all he is though; he's anointing the up and coming ( Dues), he believes in God's protection over the helpless ( Aboa Onni Dua) and he's exploring love (Pimpinaa,Twe Ma Me). He's protesting against life, and embracing it all at once. It is well. Nkontompo means lies, and it is an official single off Obrafour's latest album, Obrafoforo.